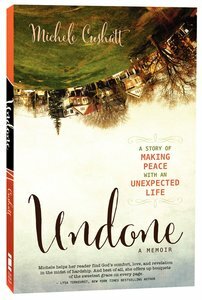 Undone is author Michele Cushatt's quest to make peace with a complicated life. It is an honest confession of a diagnosis of cancer and the joys and disappointments of motherhood and marriage, ripe with regret over what is and, yet, still hopeful for what could be. In the end, Undone turns complication into a beautiful canvas, angst into joy, and the unknown into an adventure, revealing that sometimes life's most colorful and courageous stories are written right in the middle of the mess. A storyteller at heart, Michele Cushatt speaks nationwide with Women of Faith and Compassion International, and is cohost of the popular podcast This Is Your Life with Michael Hyatt. She has written for Today s Christian Woman and MOPS International and blogs at michelecushatt.com. Michele and her husband, Troy, live in Denver, Colorado, with their six children.